The Wa Polytechnic has experienced more development projects and improvements in infrastructure over the past year thereby repositioning the technical institution for conversion into a Technical University. The facelift received by the Polytechnic in infrastructure growth, equipment and furniture acquisition, renovations et cetera, was made possible through its Internally Generated Fund (IGF) and assistance from the Ghana Education Trust Fund (GETFund). 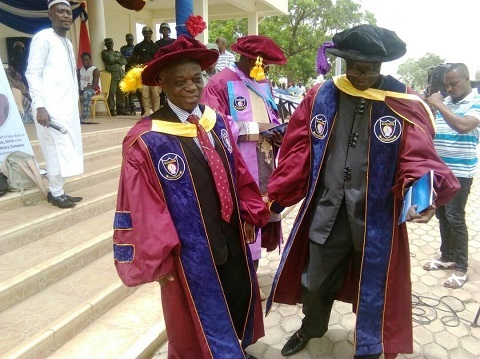 Professor Emmanuel Owusu-Marfo, the Rector of Wa Polytechnic, said this during the graduation of 709 candidates for the 2016 and 2017 cohorts who pursued and passed Higher National Diploma (HND) in various programmes. The students graduated from several courses from four schools that included; Business, Engineering, Applied Science and Technology as well as Applied Arts, Design and General Studies. Professor Owusu-Marfo said after assuming office in January 2017, it was established that the polytechnic had not accessed funds from the GETFund for about eight years, and so the necessary steps were quickly taken to secure GHC 11 million from the fund. He said with the support of the polytechnic IGF, several projects were put in place including; acquisition of vehicles, air conditioners, renovation of lecture halls, and procurement of other equipment for the institution’s workshop among other initiatives. President Nana Addo Dankwa Akufo-Addo announced in January this year that the Wa Polytechnic would be named after Ghana’s former President, Dr Hilla Liman who hailed from Gwolu in the Upper West Region. In a speech read on behalf the Acting Upper West Regional Minister, Mr Amidu Chinnia Issahaku said the government had initiated a lot of programmes and policies to empower the youth to move Ghana beyond aid. He said a lot of opportunities had been created to open about 1,000 jobs for the youth in 2018 and advised the young ones to be solution providers. The rector deserve more than this car you people are agitation about.This man is having the hope for Upper west region as far as development is concerned. For the past, this money which the rector used for the development of the school should have been in some people packets and which is bad.